British Columbia joined the Canadian Heritage Rivers System in 1995  the same year our provincial system was established. 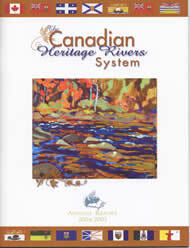 The Canadian Heritage Rivers System (CHRS) was created in 1984 by the federal, provincial and territorial governments. The CHRS aims to conserve and protect the best examples of Canada’s river heritage, to give them national recognition, and to encourage the public to enjoy, appreciate, and honour them. There are 37 Heritage Rivers across Canada, and more are being added to the system each year. The goal is to establish a system that reflects the diversity of Canada’s river environments and celebrates the role of rivers in Canada’s history and society. Establishing Canadian Heritage Rivers is a two-step process, nomination and designation. A 15-member national board administers the system. The board is made up of private citizens and senior officials from government departments responsible for the protection of the Canadian environment. Although river nominations may be submitted to the Canadian Heritage Rivers Board only by participating governments, private citizens and groups are encouraged to present submissions to their federal, provincial or territorial board member for any river felt to be of outstanding Canadian value. To be considered, the river must possess outstanding natural and/or cultural values. Accompanying recreational values are also given careful consideration. There must exist a high level of public support, and it must be demonstrated that sufficient measures will be put in place to ensure that the river’s heritage values will be maintained. Based on these criteria, the responsible government(s) decide(s) whether or not to pursue the nomination of a specific river. Once nominated, the Board reviews the nomination and, if it meets selection guidelines for the System, recommends it to the responsible Ministers. A nominated river becomes designated once a management plan or strategy, that ensures the river will be managed to conserve its outstanding natural, cultural and/or recreational values, is submitted to the Board by the nominating government(s). British Columbia presently has three rivers officially designated as “Canadian Heritage Rivers.” Other B.C. rivers have been nominated or await nomination, following a public consultation process. B.C.’s objective is to have five (5) B.C. Heritage Rivers designated as Canadian Heritage Rivers.